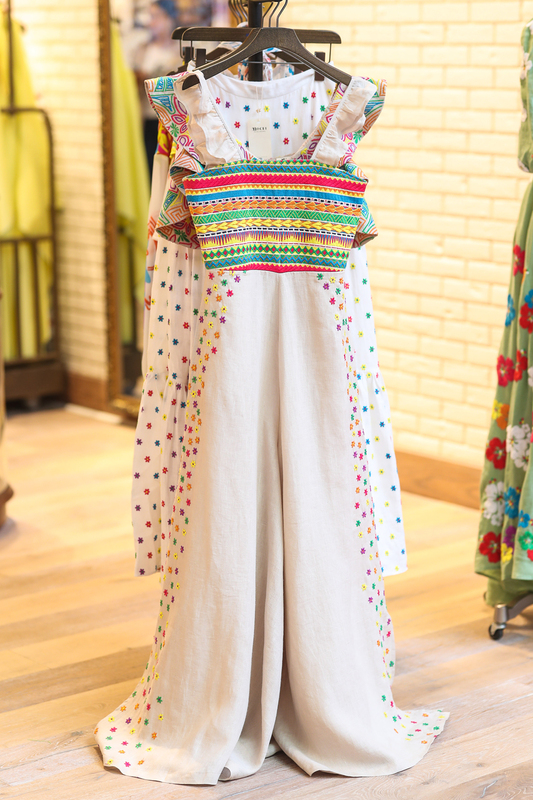 This collection is perfect for summer dreamin' and just like all of Ayah Tabari’s designs, the feminine and vibrant pieces have helped to support stitching communities. 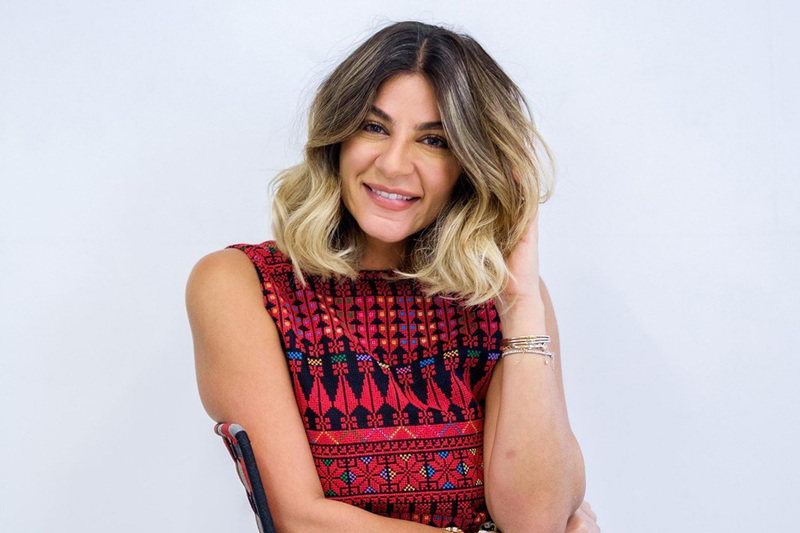 All Things Mochi Founder and designer Ayah Tabari is a true citizen of the world. The Palestinian was raised between Amman and Riyadh, studied in London and then settled in Dubai. Being exposed to such a mix of cultures fuelled her love for original designs, and she launched a label with collections that are inspired by her travels, whether they have taken her to India, Africa, Thailand, Mexico, Europe or closer to home. 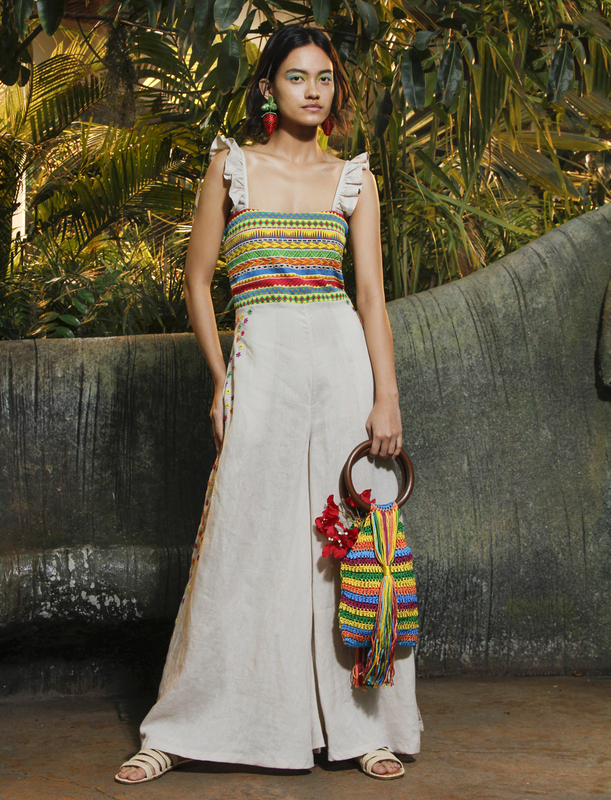 And for her spring/summer 2019 collection Tabari, who launched the renowned distinctive and fun embroidery brand in 2013, got fired all up by the pulse of Polynesian life. The pieces feature gorgeous Tiare (flowers), to emphasise the strong bond between the Polynesians and nature, and embroidery that includes Tatau (tattoos), which represent the story of the Polynesians’ lives. 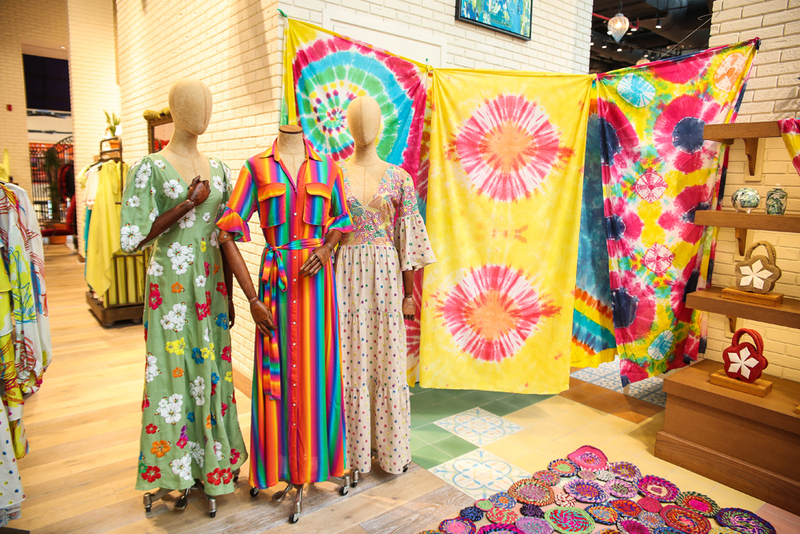 Plus, the vibrant tie-dye materials reveal the exquisiteness of unique Tahitian handmade artwork. We talk to Tabari about the collection that authentically represents the vibrant, rich and expressive Polynesian culture and why she has chosen to stock it in American Rag Cie. We also get to know more about how all her collections, which are coveted by those who love to wear something with a chilled Californian vibe, help empower women all over the world by offering job opportunities. We chat about the hurdles female Arab entrepreneurs tackle too. Tell us why you were inspired by the Polynesian culture for your spring/summer 2019 collection? The Polynesian culture is all about dance, music, art and the wonders of every day island life, especially Tahiti. The beautiful people, landscapes and essence captured my heart straight away. Which typical Polynesian details have you incorporated into the collection? Polynesians are very traditional. They embrace their beliefs and have a strong family ethic. Tatau, which represent the stories of their lives and the journeys they have faced, inspired the embroidery in this collection. Tell us about the materials you used for the vibrant collection. We introduced tie-dye into the collection. 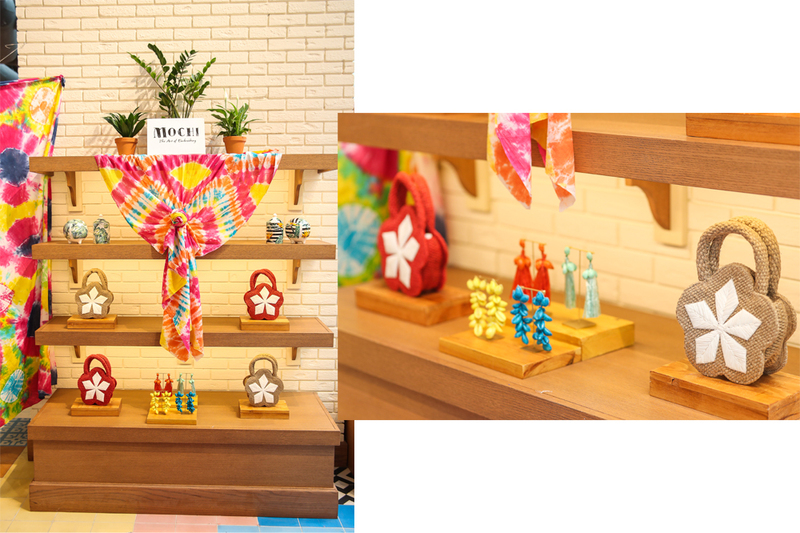 It’s vibrant and bright, which of course is what our Mochi girl is looking for and shows the unique Tahitian technique of handmade art. What did you like the most about the collection? I love everything about this collection, but especially the intricate embroidery and details in all the pieces, which are inspired by the ocean and the communities I visited. Why did you decide to stock the collection in American Rag Cie? American Rag has the perfect mix of designers, and I love the fact you can catch up with friends with a coffee and a cake! We think Mochi is the perfect fit for the more Boho, chilled girl with a Californian vibe who loves to feel great in what she wears. How does your label fit in with the other brands in the store? The store is very curated and brings together designers from all around the world to create a different shopping experience to that you would expect to find. How does All Things Mochi support stitching communities around the world? We travel extensively to different destinations and familiarise ourselves with the cultures and traditions in order to design a collection that truly and authentically represents its origins. We aim to assist these communities by creating jobs and opportunities for work and growth among these women in hopes of contributing to their wellbeing, morale and standard of living. Which other locations have inspired you during your travels? We have created 17 collections over the last 5+ years and each collection was inspired by a different location, including Jaipur, Palestine, Thailand, Morocco, Hungary, Spain, Africa, Mexico, the UAE and Polynesia. We are travelling again soon, so stay tuned! You’re originally Palestinian but grew up between Amman and Riyadh before studying in London and then settling in Dubai. How has all this influenced your aesthetics and your approach to design? I am a citizen of the world and believe that travelling and living in different countries has helped shape the person I am, as well as the way I design. Meeting many people with different cultures and traditions has allowed me to learn so much. Mochi is about expressing what I have seen on my travels and embracing new cultures by incorporating them into wearable designs. Was there a particular moment when you knew you were meant to work in fashion? I always say that Mochi found me and it was love at first sight. I was never super into fashion, I loved to look and dress nice, but what I love is going into markets and exploring what each country has to offer. I am always attracted to vintage clothing and unique pieces and love styling them. I guess you can say I’m more into timeless pieces that I can enjoy for a long time and pass down to my children. I believe fashion is a way of expressing yourself and shouldn’t be limited to what everyone’s wearing and what looks ‘good’. Which particular hurdles do you think Arab female entrepreneurs usually face? I am a proud Palestinian designer who lives in Dubai and travels the world. I believe you are limited if you allow yourself to be limited. It’s how you approach life and different situations and how you deal with them and stand up for yourself when things are tough. I mean yes, an Arab man can be taken more seriously than a woman, but we all face hurdles as women and men; every case is different. I have faced many hurdles as an entrepreneur, but with my strength and courage I have faced them straight on. I think the point is do women have to prove themselves more or work harder? Then the answer is YES, we have much more to prove. Are there any particular Arab fashion or interior designers you would love to join forces with? I appreciate all aspects of everyone’s work and talent; I can’t pinpoint one specifically. Which other forms of art (music/dance/film, etc.) influence your approach to your work or ignite something within you? I love music and dance so much! I love to see super talented people and how disciplined they are when they are perusing their dreams; I find it so inspirational. When I see someone making a career out of what they love it makes me so excited to continue what I love. Whether it’s professionally or personally, where do you go from here? I aim to maintain a personal and professional work life balance by working hard and playing hard. Enjoying life to the fullest and remembering that money is not why I started and what shapes me. It’s about milestones and how I shape myself as time goes by.